A small meteorite hit the Nicaraguan capital, Managua, on September 6, government officials say. Residents reported hearing a loud bang and feeling the impact, which left a crater 40ft wide and 16ft deep. Government spokeswoman Rosario Murillo said the meteorite seemed to have broken off an asteroid which was passing close to Earth. Rosario Murillo said international experts had been called in to investigate further. No-one was hurt when it hit the wooded area near the international airport and an air force base. An adviser to Nicaragua’s Institute of Earth Studies (INETER), Wilfried Strauch, said he was “convinced it was a meteorite” which caused the impact. 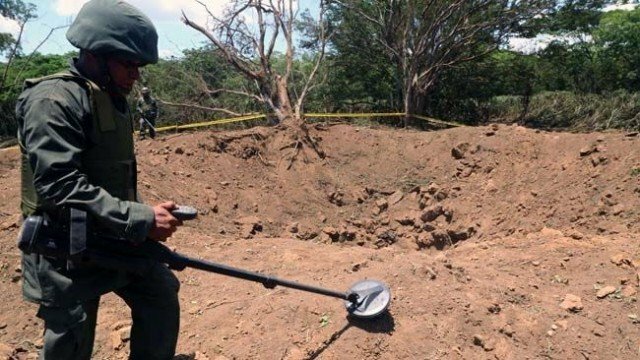 Experts studying the crater said it was not clear whether the meteorite had disintegrated upon impact or had been blasted into soil. Locals said they heard a large blast just before midnight local time and reported a burning smell. “We thought it was a bomb because we felt an expansive wave,” Jorge Santamaria told Associated Press news agency. INETER scientist Jose Millan said that “we need to celebrate the fact that it fell in an area where, thank God, it didn’t cause any danger to the population”. Managua, which has more than a million inhabitants is densely populated. “All the evidence that we’ve confirmed at the site corresponds exactly with a meteorite and not with any other type of event,” he said. “We have the seismic register which coincides with the time of impact, and the typical characteristic that it produces a cone in the place of impact,” he added. Astronomer Humberto Saballos said the meteorite could have broken off from the 2014RC asteroid which passed Earth at the same time. 2014RC, which is the size of a house, came closest to earth at 18:18 GMT on Sunday, when it passed over New Zealand at a distance of about 25,000 miles. The asteroid was first discovered on 31 August and, at its closest approach, was about one-tenth of the distance from the centre of Earth to the Moon, NASA said in a statement. It is expected to orbit near Earth again in the future. In February 2013, a meteorite exploded over Chelyabinsk in Central Russia, injuring more than 1,000 people. NASA currently tracks more than 11,000 asteroids in orbits that pass relatively close to Earth.